Fernando Alonso is the 2006 Formula 1 World Champion - and deservedly so, for he fought back through much adversity to retain his World title with dignity and authority. And that is how it should be. And yet, one felt almost sorry for Michael Schumacher for luck was not on his side. In his career he has often been lucky. Often he has made his own luck but in the last couple of weeks things have not gone well. But he too drove like a champion, he came back from a huge disadvantage and finished fourth, just 4.7secs behind Alonso. It was an astonishing performance. It was sunny at Interlagos on Sunday morning and the Brazilians were light-hearted, cheerful and enthusiastic as they have been every year since the famous occasion when the whole grandstand stood and gave the Nazi salute and chanted "Sieg Heil" at FIA President Jean-Marie Balestre back in 1991 after he had crossed swords with Ayrton Senna. In Brazil Senna is never far from one's thoughts. And that was what Felipe Massa was thinking about in the hours before the race. The last time a Brazilian won the Brazilian Grand Prix was in 1993 when Senna won an astonishing victory - as he often used to do. "It has been 13 years that a Brazilian has not won a Grand Prix," he said "Thirteen years ago it was Ayrton Senna. Everyone watched that race. Even me, I was still a kid - 12 years old. I watched it from home, not at the track." There is a passion about Interlagos that one does not see anywhere else in F1. Sao Paulo has a host of drawbacks, but it is a place where F1 sees the passion that exists for the sport up close and personal. No-one is left unmoved by such things. This is why we go racing. This is what it is all about. All the ugly stuff that goes on in the back rooms of the sport and all the bottom-feeders who live in those murky depths evaporate on days like this. It is about the joy of racing - about a final conflict to decide who wins the game. We knew that Michael Schumacher would have trouble winning from 10th on the grid but we knew too that the Ferrari was a rocket ship this weekend and that the warmer temperature was not going to help the Michelin runners. We knew that if Michael could get to second place, he would win the race. Massa would sacrifice the dream. The action came thick and fast. Massa took the lead at the start with Kimi Raikkonen and Jarno Trulli ahead of Fernando and Jenson Button. Michael Schumacher had a lot to do and was down on the inside line, trying to find a way to pass the men ahead of him. He was squeezed by Robert Kubica, who had Ralf Schumacher and Nick Heidfeld outside him. There was no room and Michael had to give but as they went thundering down the hill Michael was trying to pass the two BMWs. Ralf was already history. At the bottom of the hill Lady Luck gave Michael a wink. Kubica tried to go down the inside of Heidfeld and the two BMWs both went wide. Michael swerved inside and was up to seventh. Behind them there was a disaster for Williams when Nico Rosberg ran into the back of Williams team-mate Mark Webber. He removed the rear wing of Mark's car and his own front wing. And then as he headed up the hill towards the pits the car suddenly snapped and Nico had a sizeable crash. There was wreckage all over the place and on this occasion the Race Direction decided that a Safety Car was necessary - a good decision after the lunacy that we saw in Turkey. This was, of course, a great help for Michael Schumacher because it meant that the top seven stayed together behind the Safety Car and he did not lose time behind the slower men ahead of him. The track was cleaned up and the race restarted at the end of lap six and Massa took off at great speed. And now the Safety Car's intervention worked against Michael because as he pushed the limits to pass Fisichella he probably picked up a bit of wreckage that cut his tyre. At first sight it looked as though he and Fisichella might have touched but careful examination of the available footage showed that this was not the case. Michael's car went suddenly wobbled when he turned in and he was suddenly crawling around to the pits, his left rear tearing itself apart as he went. For Schumacher the game was over regardless of what happened to Alonso, the win he needed was beyond his grasp. But Michael rose to the challenge and drove a stupendous recovery drive. With a tankful of gas and nothing to lose Schumacher was at his most impressive. It took him until lap 28 before he caught the first backmarker but then he worked his way through the riff-raff aided to a small extent by some pit stops. Michael did not pit until lap 47 by which time he was up to sixth. His stop dropped him back to eighth and then Kubica disappeared into the pits for his second stop and Michael was left with Barrichello in his sights. Rubens barely put up a fight. Michael then hastened to the rear of Fisichella - he was back where he had been when he got the puncture. 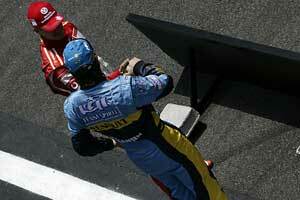 For nine laps Fisichella held on. Schumacher made a mistake and lost time but came steaming back and on lap 63 he made his challenge. Fisichella tried to hold on but he braked too late and went wide on to the grass. Michael was through and gone. Ahead was Kimi Raikkonen and the Ferrari was quickly on the tail of the McLaren. For five laps Kimi fought a grim rearguard action, slowing Michael as he did so. And then Michael went for the inside line at the first corner. Kimi moved across and then Michael went in even deeper. Kimi sportingly failed to make a second move. But that was it. There was no time left to catch Jenson Button and Fernando Alonso. "The race was rather chaotic, I guess that's the right word for it," Schumacher said. "We had an insanely quick car today. I'd have to say it was a class finale with the car, with the speed we've got. But it just wasn't meant to be today, for me." Indeed not. But he went out with a flourish and good for him. But it was not enough. Alonso had the Drivers' title by 13 points and Renault took the Constructors' by five points. It was a great day for the sport, a great day for the concept of sporting behaviour, a great advert for F1 - and great television - done brilliantly by TV Globo. "It has been a fantastic weekend," Alonso said. "It was a very good race for us. I only needed one point but for sure if I could help the team become Constructors' champion, I was ready to do it. Ferrari were too quick for us today, and there was a lot of pressure from Jenson, but after Michael's problem we turned down the revs and I managed to finish second." Fernando also had good words for Schumacher. "It's been very close between us, and it's been good to fight with him," he said. "I have always said to become champion when Michael is still on the track made it more valuable. I was extremely lucky win last the two championships, and we all wish him the best for his new life with family. It's been a pleasure to race with him." But as everyone praised the two title contenders, Massa was the man getting the adulation of the crowd. "Winning my home Grand Prix is amazing. It is fantastic. A dream comes true. I saw all the people jumping and dancing just for me because I won. It is fantastic that is just for me. It is absolutely fantastic. When I took the flag (from the spectator) I remembered Ayrton Senna taking the flag in Monaco for instance. For me a flag at my home Grand Prix was fantastic. I stopped to find a flag and I think that someone tried to jump in my car. It was great." It was a good day too for Jenson Button and Honda, the Briton pulling off a nice pass on Raikkonen on lap 29 and then hounding Alonso all the way to the flag. "It's a great way to end the year and one of most enjoyable races I've had, fighting through the field," he said. The remaining points went to Raikkonen in fifth, Fisichella sixth, Barrichello seventh and Pedro de la Rosa eighth. Worthy of note was Takuma Sato who drove a great race for Super Aguri to finish 10th. Sakon Yamamoto set the seventh fastest lap of the race - a mighty achievement - and Sato was ninth fastest. And so Michael departs. Going out as he came in 15 years ago - with a bang. The field is now clear for the youngsters to fight it out between themselves. Next year is going to a brave new world. It is just five months away.